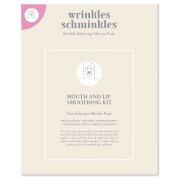 Improve the appearance of ageing skin with the Wrinkles Schminkles Chest Smoothing Kit; a simple solution with visibly results. Worn during sleep, the smoothing kit consists of a non-invasive, medical grade silicone pad, which when applied to the delicate chest area, works to effectively reduce the appearance of wrinkles and fine lines. The pad visibly smoothes the skin on the chest, cleavage and décolletage, creating a youthful appearance. The smoothing pad will allow you to wake up feeling refreshed and ready to begin the day with confidence. Step 1. Applying: Before going to bed, wash and dry your skin – keeping it free of moisturisers and creams. Peel the plastic film from the Chest Pad and apply to your skin with the self-adhesive side down. Step 2. Cleaning: Pads are re-usable but they will begin to lose their adhesiveness after 20-30 uses. Clean them with the specially-formulated Cleaning Solution you give them new life – ready to be used again and again. NOTE: Beauty sleep isn’t only enjoyed at night time. Use the Silicone Pads - night or day- whenever you have some private time to treat and smooth out your pesky chest wrinkles.